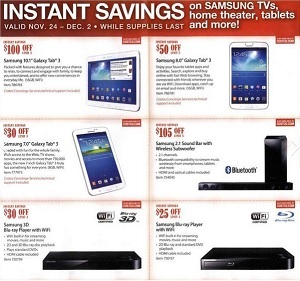 Don’t miss Fred Meyer Black Friday deals – just before Cyber Monday 2013. 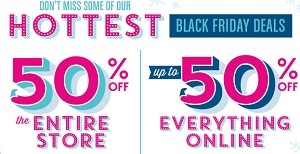 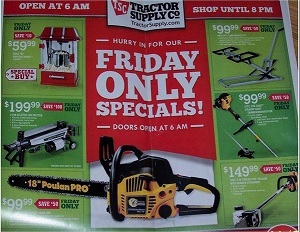 Best Fred Meyer Black Friday 2013 deals: 50% off all socks; save 66% on women’s rampage boots; $19.99 Great Northwest Shearling Suede slippers; $6.99 men’s & women’s rolled fleece sleep pants; $399.99 GoPro HERO3+; $24.99 7″ digital picture framer; $49.99 Fuji FinePix AX650 camera bundle; $99.99 Canon PowerShot ELPH 115 camera; BOGO free all board, handheld & card games; save 20% on all video games software & accessories, movies and music; $199.99 Nikon CoolPix L820 camera; $69.99 ProScan 7″ tablet 4GB with keyboard; $3.99 Florist quality poinsettia; save 60% on men’s coats & jackets; $9.99 6-device giant remote; save 60% on all women’s bearpaw or all misses’, women’s Plus & junior sweaters; $4.99 fashion loops & scarves; 50% off all open-stock ceramic dinnerware & serveware; $34.99 Northpak 4-piece luggage set; 50% off all garden decor, bath towels, lamps, art, mirrors, clocks and shelving; $84.99 Pro Fusion Quartz infrared portable heater; $19.99 Stompeez, Flippez or Flashlight Friends; $249 iPad mini 16GB; $199.99 iPod touch 16GB 5th Generation; $49.99 iHome iD95 dual alarm clock radio; $49.99 Linksys E2500 wireless N dual band router; $299.99 Asus 11.6″ TouchScreen notebook; $199.99 LG 32″ Class LED 720p HDTV; $199.99 PS3 Black Friday 250GB bundle; $169.99 PS Vita Wi-Fi; $12.49 Xbox Live 3-month Gold card; and more. 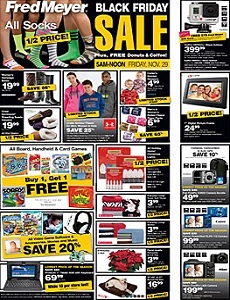 Check all Fred Meyer pre-Cyber Monday 2013 deals and sales on fredmeyer.com.